UPDATE 1245 GMT: The Assad regime and Iran have each denied that an Iranian drone entered Israeli airspace, the cited cause for Israel’s attacks on regime and Iranian positions inside Syria early Saturday. The regime’s Central Military Media said the Israeli strikes, including an attack on the Iranian control station for the drone in Homs Province in central Syria, was a “terrorist act” and warned of “a tough and serious response”. The statement said the station was hit while drones were on regular missions in the desert in the province. A spokesman for Iran’s Supreme National Security Council said the regime response to Israel’s air force was “a clear warning to Israel. The era of Israeli strikes on Syria is over.” He vowed a “relentless response” to “all further aggression”. The deputy chief of the Revolutionary Guards, Brigadier General Hossein Salami, said Iran will “bring hell upon the Zionist regime“. UPDATE 1025 GMT: The Israel Defense Forces say they have carried out “large-scale attacks”, following their initial strike on an Iranian facility in central Syria and the Assad regime’s claim that it downed an Israeli F-16 warplane. The IDF said it hit 12 additional targets, including three aerial defense batteries and four Iranian positions “that are part of Iran’s military establishment in Syria”. Residents said the sounds of explosions could be heard to the south and west of Damascus. Six missiles reportedly fell near the Presidential Palace in southern Damascus. IDF spokesman Jonathan Conricus said, “Syrians and Iranians are playing with fire. We are willing to extract a heavy price on anyone who attacks us.” However, he said the IDF is “not interested in escalating the situation”. Israel has attacked “Iranian control systems” in Syria after intercepting a drone that entered Israeli airspace. The IDF said the drone approach at around 4 am, setting off alarms near the Sea of Galilee. An Apache helicopter shot it down, and the army said it has the remains. The IDF said it attacked the drone’s launch site, the Tiyas Military Airbase near Palmyra in central Syria, in “a complicated surgical strike” which targeted a facility housing the unmanned aircraft’s Iranian operators. 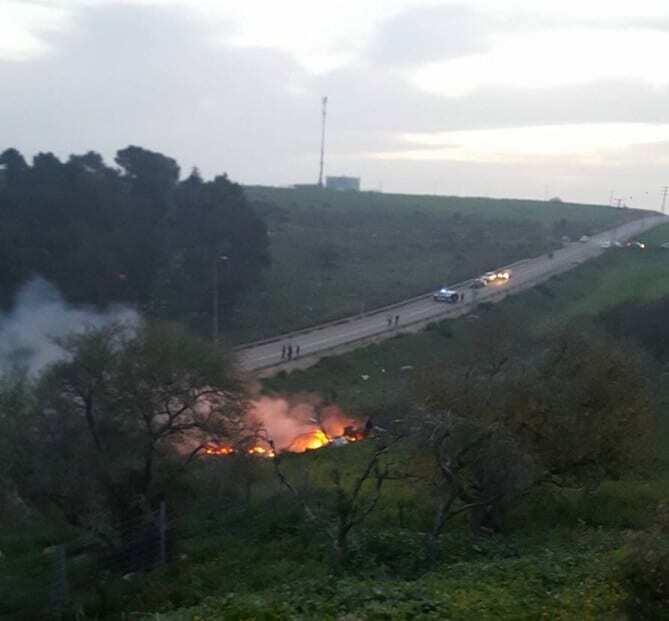 The military added that the downed Israeli F-16 jet had been targeted by anti-aircraft fire before it crashed. One pilot is in serious condition after ejecting, while another is lightly wounded. Air raid sirens were set off in northern Israel as Assad regime forces fired anti-aircraft artillery. One of the missiles fell inside Israel, but caused no damage. Israeli officials, including Prime Minister Benjamin Netanyahu, have vowed that Iran and its ally, Lebanon’s Hezbollah, will not be allowed to establish positions near the Israeli-occupied Golan Heights. The IDF has periodically attacked regime facilities, warehouses, and convoys inside Syria to disrupt the supply of weapons to Hezbollah and to keep Iranian-backed forces from assembling near the Israeli border. Earlier this week, Israeli warplanes again reportedly struck a major regime defense complex north of Damascus. The Jamraya facility is reportedly instrumental in the regime’s missile development and chemical weapons program.